Sound "Some listeners attribute newfound sonic abilities to record cleaners and cleaning fluids, but I simply haven't heard any differences, even though I have used other record cleaners alongside the HW-27. A clean record is a clean record, and any improved midrange texture or enhanced treble sparkle hasn't resulted from one cleaning machine or fluid over another. However, some cleaning machines, and especially cleaning fluids, do work better than others, leading to a more noiseless LP, which is the goal of cleaning records in the first place." Use "You apply cleaning fluid to the record, which spins on a platter similar to the one on your turntable. You work in the fluid with a brush or pad, then remove it with the machine's vacuum system -- a spring-loaded wand whose suction power pulls it down to the spinning record's surface, then releases after the vacuum has been turned off. " Value "If you can't justify or afford [the HW-27's] cost, I'm sure the HW-16.5 and HW-17 will do as good a job, though at the price of extra noise and a little extra work." Are you serious about analog playback? I suppose all audiophiles who love LPs think they are, but there is a single question that can determine this: Do you own a record-cleaning machine? If you do, you know that what it does cannot be equaled with any amount of audio hardware. If you don't, you literally don't know what you are missing. Even new LPs and ones you are sure are clean will sound better after a good machine cleaning -- "better" meaning lower in all types of nonmusical noise, including the dreaded ticks and pops that can snap even the most involved listeners out of their music-induced stupor. More than any accessory I am aware of, a record-cleaning machine is vital for lovers of analog playback and its unique sonic appeal. Harry Weisfeld, head of VPI, came to this same conclusion over 25 years ago when he introduced his first record cleaner, the original HW-16. This did its job in a straightforward way that was novel when the unit first hit the market. It now seems ubiquitous: You apply cleaning fluid to the record, which spins on a platter similar to the one on your turntable. You work in the fluid with a brush or pad, then remove it with the machine's vacuum system -- a spring-loaded wand whose suction power pulls it down to the rotating record's surface, then releases after the vacuum has been turned off. Used fluid is collected in a reservoir for later disposal. 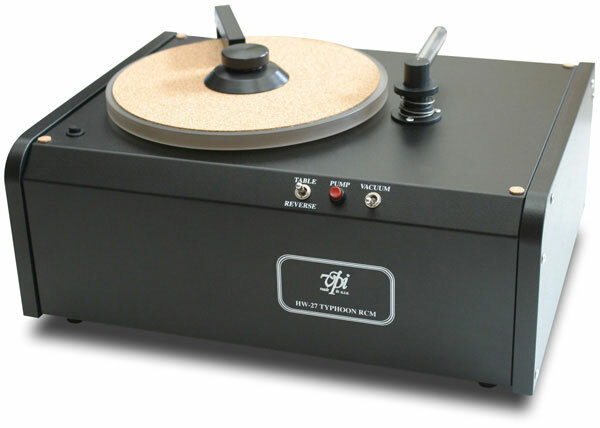 All these years later, this same general design concept has found its way into competing products as well as other machines from VPI, first the HW-17, which was designed for heavier-duty cleaning than the HW-16 (and has since been replaced by the HW-16.5) and the HW-27 Typhoon, VPI's most robust and powerful cleaning machine. "Robust and powerful" in what ways? First, like the HW-17, the HW-27 ($2000 USD) was designed and built for intensive use -- hours on end if need be. VPI understands that cleaning a record here or there isn't as fruitful as putting aside a few hours to clean batches at a time, and the HW-27 can seemingly run all day. It has twice the suction power of the HW-17 or HW-16.5, which doesn't necessarily make it a markedly better cleaner but does have its positive effects that I'll talk about. The motor is also quieter than that of the other VPI machines, whose noise has been a persistent complaint of owners. The HW-27's platter is made of frosted acrylic and its case is fashioned mostly of sheet metal, both of which are more durable than the materials used for the other VPI machines. Its top area, where all of the action happens, is more accessible, so getting at the vacuum wand, for instance, is easier. Like the HW-17, the HW-27 has a built-in fluid applicator that the HW-16.5 omits. This allows you to apply your favorite cleaning fluid without having to keep the bottle nearby. I actually use this strictly for ultra-pure water, preferring to clean in multiple steps and rinse with water. The applicator has a integral brush that helps in scrubbing the record surface clean of debris. There is also a switch that controls the direction of the turntable, which makes bi-directional cleaning possible. While using the HW-27 is uncomplicated, I have discovered over the course of cleaning hundreds of records that some personal wrinkles in the process lead to better results. Again, using water in the applicator is one of those. Another is how I prep the machine before using it. I clean the applicator's brush, removing dust that has worked its way into the bristles, by running a pen or other clean plastic item up and down the brush's length. After that, I check the plush "lips" of the vacuum wand, using a lint roller to remove any loose debris. This also raises the nap, making the "lips" a little more cushiony. I know that some VPI owners insist on using different vacuum wands for each cleaning fluid, and I've tried this as well. I've noticed no difference from simply using one wand to vacuum up all fluids, perhaps because I make sure the wand is clean from the beginning. Right now, even after over 200 vacuum cycles, the wand on the HW-27 looks essentially new. As a final prep step, I clean off the cork mat affixed to the platter, using compressed air to blow all dust off it and the machine itself and then finishing with a lint roller. The mat is another point of obsession for owners, some going as far as using different mats for each side of a record. I've found that preserving the mat's cleanliness is always a good thing, so I blow off dust in between cleanings too. I've settled on the Audio Intelligent Vinyl Solution fluids -- enzyme solution, cleaner and ultra-pure water -- as they work very well and are less expensive than their competition. Each VPI cleaning machine ships with a bottle of the company's own cleaning solution, and it's good as well, especially when it's spiked with some isopropyl alcohol. I apply the AIVS enzyme and cleaning solutions with Mobile Fidelity brushes, working them in before vacuuming them off. After three separate rounds of cleaning, making ample use of the HW-27's two-direction rotation, the LP is as sparkling as it's going to be, and into a new rice-paper inner sleeve it goes to preserve its squeaky-clean state. With proper storage, my records shouldn't need recleaning. If you're thinking that I haven't said much specific about using the HW-27 up to this point, you are perceptive. In all honesty, once you've cleaned a few LPs with it, the process becomes second nature: apply fluid, work it in, vacuum; apply fluid, work it in, vacuum. The HW-27 simply duplicates its function without issue every time. Oh, sometimes with really flat LPs, the vacuum wand will stay down on the surface longer than usual, and sometimes the applicator brush will need adjusting so it meets the record's surface just so, but that's about it in terms of issues. Once you develop your regimen, the HW-27 does nothing to cause you to deviate from it. The process becomes nearly automatic. The end result is nearly automatic as well: The record is utterly clean, often gleaming in the light once its coating of dust and grunge has been removed. The HW-27 has worked wonders with some of the thrift-store and garage-sale LPs I've bought, removing even thick layers of gunk I wouldn't want near my turntable. Obviously, the HW-27 can't fix scratched or severely warped LPs, but it can clean both of them. Some people have complained about the VPI vacuum wand not being able to negotiate warps, but this is more an idea based on how the wand works than a matter of fact. From my considerable experience, warped records come out just as clean as ones that are ruler flat, even records that no tonearm can track. Some listeners attribute newfound sonic abilities to record cleaners and cleaning fluids, but I simply haven't heard any differences, even though I have used other record cleaners alongside the HW-27. A clean record is a clean record, and any improved midrange texture or enhanced treble sparkle hasn't resulted from one cleaning machine or fluid instead of another. However, some cleaning machines, and especially some cleaning fluids, do work better than others, leading to a more noiseless LP, which is the goal of cleaning records in the first place. If you want to change the sound of your LPs, try different cartridge loading. With record cleaning, all I hope to accomplish is the most obvious result: a record that's less noisy. Before the HW-27 arrived, I was using very successfully an HW-17F ($1300), whose built-in fan ensures that it can also seemingly run without pause. I've already mentioned a couple of differences between the two machines, including a different vacuum motor that produces stronger suction with the HW-27. However, I honestly can't say that the HW-27 cleans better than its less expensive brother. I thought this should be the case, and I recleaned a number of records to try to prove that it was, but the HW-27 never removed ticks or pops, for instance, that HW-17F-cleaned records exhibited. But there are a few advantages to the HW-27 and thus reasons to buy it instead of the HW-17F. The HW-27 is quieter than the HW-17F. VPI says the difference is 6dBs, which doesn't seem like much -- both machines still make a fair amount of noise -- but the difference is noticeable. Second, the HW-27's extra suction power saves you time, as the HW-27 generally has removed all fluid after one revolution (I always give it a second just to be sure), while three revolutions are minimum for the HW-17F. Fewer revolutions also make for less static, which is a byproduct of the vacuum wand's "lips" lightly rubbing against the record, and therefore less dust will adhere to your newly cleaned LP. This alone could account for some people's thinking that the HW-27 does in fact clean better than the HW-17F. Often copied (including by VPI itself), Harry Weisfeld's idea of how to clean a record simply works, and the HW-27, his most powerful record cleaner, has become an indispensable piece of audio equipment for me -- I won't even call it a mere "accessory." If you can't justify or afford its cost, I'm sure the HW-16.5 and HW-17F will do as good a job, though at the price of extra noise and a little extra work. 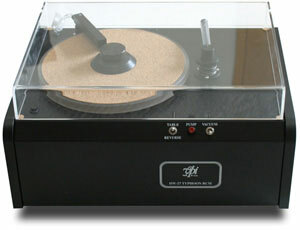 Either way, get serious about your records and get one of these VPI machines. You won't regret your purchase.